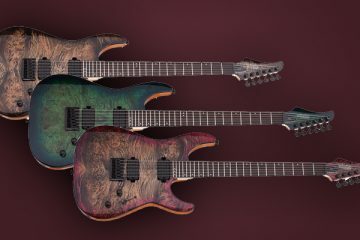 In the past couple of years, Schecter has really stepped up their game and started offering really amazing guitars. With models such as the Banshee Elite and the KM-7 MK-II, we’ve been seeing some affordable models with boutique-like specs. Today, we’ll be looking at the quite affordable Schecter Blackjack ATX C-1, a basic Schecter guitar that features a few surprise features. Right off the bat, you’ll notice some exciting features that you don’t get every day on an affordable, production guitar. On the ATX C-1, you get ‘Glow in The Dark Side Dot Inlays’! Of course, these don’t serve much functional use other than to look really sweet and help you see what you are playing in the dark. It’s really neat to get on an affordable instrument, though. A few years ago, you pretty much needed to order a full-on custom guitar to get these! ‘Luminlays’ actually made it onto our Top 5 Best Modern Guitar Features. 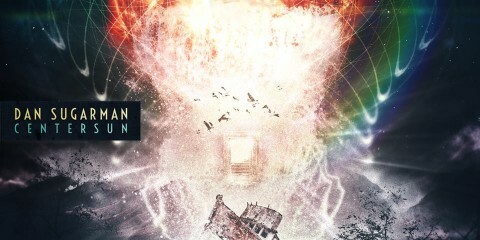 Go check that out for other neat, modern appointments to guitars. The Schecter ‘Thin C’ neck profile and 14″ fretboard radius are somewhat of the “middle ground” of all guitars. It’s not a thin profile, but it certainly isn’t thick. I’d say it’s great for the guitarist who is seeking something that is comfortable for any style of playing, without being centered on one thing. One of my favorite, if not my absolute favorite body wood has to be Swamp Ash. Although this guitar is totally finished over and you can’t really see much grain, I was excited to see that it was made of Swamp Ash. You don’t really see much of Ash in the affordable range right now. Ash has a lot of open and porous grains that allow it to give off an almost “popping” sound when played. This intense attack and clarity make it extremely well suited for down-tuning and extended range guitars. Read more about that in our Ultimate Guide to Tonewoods. On top of ash, the ATX C-1 features an Ebony fretboard! Ebony is a very dense and oily wood, which means that it doesn’t have to be finished or sealed to last a long time. This is great for players who want a faster playing neck! 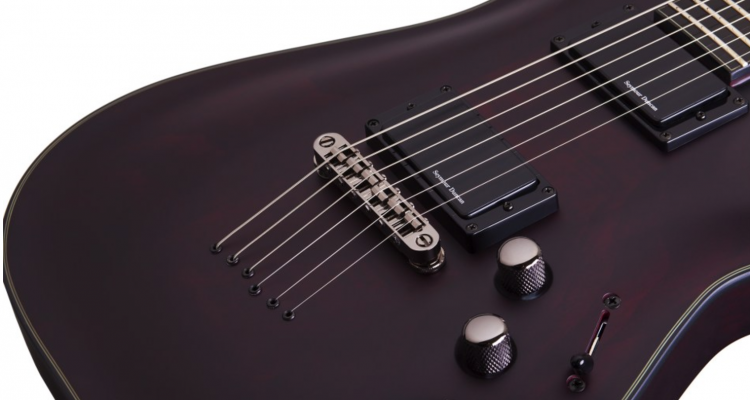 The pickups chosen for the ATX C-1 are the Seymour Duncan Blackouts. These active pickups have a very high output and are intended for the angriest of metal tones. In comparison to the infamous EMG 81/85 set (which apparently everyone loves to hate on), the Blackouts have a more controlled high end and a fatter low end. They don’t do clean tones the best, and they certainly don’t play nice with mid-gainy sounds, but boy are they punchy for distorted, heavily saturated tones. The guitar is definitely intended for metal. The Blackouts, mixed with the Ebony Board and Swamp Ash body, make for really heavy tones without sacrificing clarity and attack in the low end. 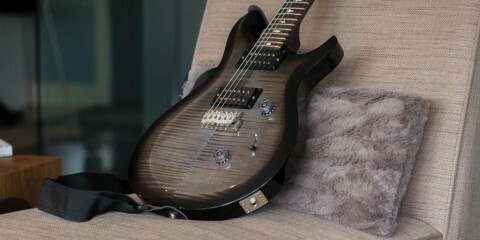 Schecter’s quality standards have become increasingly better over the years. This is a Korean-made instrument, so it’s not to the USA shop standard, but it’s still above par for the price. Most of the issues I found were very minor, and they didn’t really affect playability. The binding on this guitar felt very cheap, and there was some finish overspray on the headstock that looked a little bit rough. There was also some finish bubbling in the same area. It looked like the finish might have been rushed around that part of the guitar. Other than that, there wasn’t anything to be found. The guitar played really well, and the bridge and neck were quite comfortable to play. The only other thing I would mention is that the Schecter Locking tuners used weren’t the best thing I’ve ever used, but certainly not the worst. If it were my guitar I would probably upgrade those pretty much immediately and have a really solid guitar. 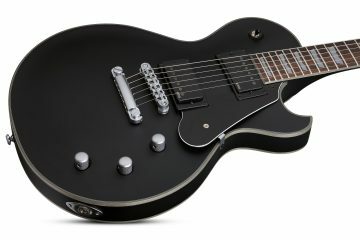 The Blackjack ATX C-1 is an affordable guitar that features a ton of fancy features that you don’t usually get under $1000. It’s really comfortable to play for just about any kind of player, features a super fast Ebony fretboard, and produces a super angry metal sound. I’d say this guitar would probably make an awesome live workhorse for metal styles.